She’s had a reputation for decades for being a little plastic and fake, but Barbie may finally have a chance to show some personality, even if it’s artificially engineered. After years of not having a voice of her own, Barbie is finally getting one: Hello Barbie, Mattel’s soon-to-be-released version of the iconic toy, will be able to tell jokes, play games, and even remember your child’s specific interests or preferences. Now capable of two-way conversations, Hello Barbie uses WiFi to interact with whomever is playing with her and, amazingly, to remember information shared during these conversations for future use (a skill we find cool and creepy at the same time). Hear Barbie’s voice for the first time after the jump! How will Barbie manage all this while still looking fashionable? LED lights, a speaker, and a microphone will be tucked into Hello Barbie’s necklace and her famous gams will hide two rechargeable batteries, which once fully charged, will function for about an hour. This toy mash-up of old and new, created in conjunction with software start-up Toy Talk, obviously brings up some interesting privacy issues since the voice recognition technology is processed in “the Cloud.” And while Hello Barbie’s new skills make for a more interactive playtime experience of sorts (she can apparently also tell stories), we know that one of the elements of Barbie we actually approve of was that she could be part of a vivid and low-tech world of play pretend. With cost estimates between $50 and $75, Hello Barbie has an elevated price tag that reflects her new digital makeover. She�s had a reputation for decades for being a little plastic and fake, but Barbie may finally have a chance to show some personality, even if it's artificially engineered. 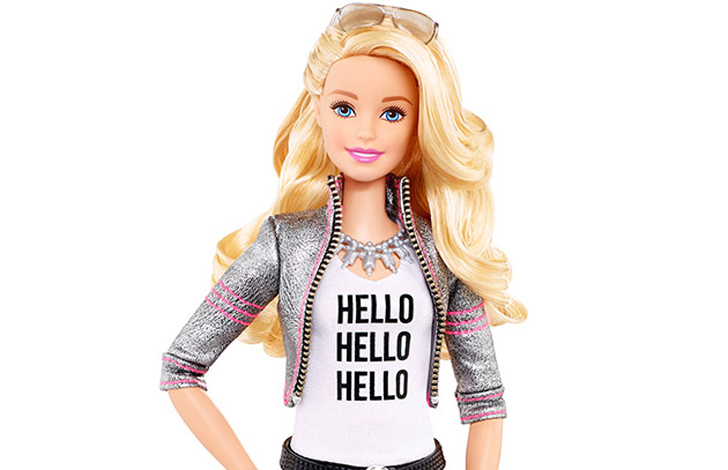 After years of not having a voice of her own, Barbie is finally getting one: Hello Barbie, Mattel�s soon-to-be-released version of the iconic toy, will be able to tell jokes, play games, and even remember your child�s specific interests or preferences.�Now capable of two-way conversations, Hello Barbie uses WiFi to interact with whomever is playing with her and, amazingly, to remember information shared during these conversations for future use (a skill we find cool and creepy at the same time). Hear Barbie's voice for the first time after the jump!